Here’s a really great response from a running ahead user (and my neighbor!) Dave M who really took the time to discribe his BQ race. Thanks for filling this out, Dave, it was a pleasure to read! Age (at the time of first BQ): 33? Weight (at the time of first BQ): 145-150, can’t recall. At which marathon did you get your first BQ? What was your finishing time? Tell us a little about the race. I picked the 2010 Hudson Mohawk Marathon because of its close proximity to NYC and high number of BQ’s due to the mostly flat, slightly downhill course and the cool Autumn timing. I was well trained and thought I could nail it. I’d raced several marathons before and was getting faster each time and was just coming off my first win in a local 5K, feeling I could do anything. The race is small, under a thousand people. It was a really nice sunny cool day from what I recall. I started off on the line with the lead 5 or so guys. I took off feeling great, I was running sub 7 and it felt effortless. I figured, I’ll do this for 3 miles and pull it back a bit. For about the first six miles I ran along with the second place girl, just cruising along. Around mile 8 I dropped the gal and met up with a nice guy from Texas who was also shooting for his first BQ. We were pushing a bit faster pace than I wanted, sub-seven mil miles. He wanted to go sub 3 hours, I just wanted to break 3:10 but I ran with him until the halfway point. He was really chatty and I was thinking all this talk would ruin my chances but the Midwesterner in me didn’t want to be rude. He pulled away at mile 14 and we wished each other good luck. At that point I felt I had only run 4 miles and was feeling amazing I started to imagine, just how will I feel when I BQ? Will I sprint the last 100 yards? Will I jump across the line kicking my feet up in some kind of Irish Jig? Would I break out and sob? I’d seen videos of other people finishing, they usually sobbed with relief, pain, excitement all rolled into one. It usually even choked me up to see it, knowing how hard they’d been training and understanding just how badly they wanted that moment. The feeling of floating along effortlessly and the positive daydreaming lasted a few more miles before I started noticeably slowing. It wasn’t long before the 2nd place girl from earlier caught me, and she was looking fresh. I’d gone out too hard, chatted with Mr. Bullhorns too much. I was cocky and now I was going to pay for it. I was starting to wonder how long I could hold the pace, which had now slowed to 7 min miles, a pace I could definitely now feel and had to work to maintain. But I kept pushing. By mile 21, where most hit the wall, I was feeling it. The doubts were really starting to creep in. I wanted to slow, or just walk a bit. I knew I was losing time and could no longer calculate the amount extra I had “in the bank.” My mind was mushy and my body was too. This worry came and went, came and went, I think it coincided with the flatness of the course. Any little hill felt like a mountain and the flats still felt like mountains. At mile 24 I really wanted to walk. I told myself one more mile and I could walk a bit, and just to wait. There’d always be another race and another chance to BQ. I should just take it easy, I’ll still have a PR and a great run. Just one mile and I could stop. But by mile 25 I started to battle the doubts, telling myself I was going to Boston if it killed me. There’d be no walking today, damn it! But my body’s response kept saying: IT HURTS IT HURTS! Just walk for a MINUTE! I felt I was on the line and if I slowed a second I’d miss my BQ cut off but I couldn’t go any faster and I was now really worried! I’d come so far, only to fail in the last mile. It hurt! But mile 26 came along finally, and I knew I could do it. I had to do it. I hadn’t walked yet although I really wanted to since what felt like forever-ago. Still, that last point two miles was becoming an eternity. Shouldn’t it be here by now? Can’t I be done? Haven’t I worked long enough? Would I fall over 10 feet from the finish line? If I did, would I have time to crawl along to finish and still BQ? Finally I saw my wife yelling for me to keep going and to push it, and I could see the finish line. I push through. The clock says 3:08:14. I had time to spare! But there’s nothing left in my legs and I’m more excited that I get to finally walk now. I’ll be excited I qualified for Boston later. I don’t sob, I hobble. But I do smile. How long had you been running when you ran your first BQ? Did you run in college or high school? I ran in HS XC and through college and grad school but not for the school, just in occasional local little races. What was your approximate lifetime mileage at the time of your first BQ? Thousands of miles, I have no idea. I had several marathons under my belt by then, plus a few ultras. How many miles did you run in the year before your first BQ? Approximately how many races did you run in that year? 15 or 20 of various distances. Did you follow a canned program? If so, which one? If not, can you give us an idea of what your training philosophy was? No program, just ran when I wanted to, most days, because I like it. I did read a lot of programs, but felt I just needed to make sure I ran a lot, did my long runs, remembered to recover sometimes, and do some speedwork along the way. It was probably all over the place but it worked for me. Did you run with a running club or utilize a coach? I ran with a group of friends and I think I was coaching on a triathlon team at that point (which I do now too). Did cross training play a role in your training? If so, how? Lots of biking and some swimming on off days. Did speed work play a role or specific workouts play a role in your training? If so, how? I did speedwork about once a week but I also raced a lot of local races, shorter distances (5K, 10K, some half marathons). Any other thoughts you would like to share with those of working towards a BQ? It’ll come if you want it and work at it. Running with like-minded people with similar goals will help. Do some speedwork to know you CAN go fast, but don’t forget those long runs, which will really help mentally when you find yourself in the final miles of the race. And enjoy the experience! I have a t-shirt that says something like “Boston: Running’s Victory Lap” and that’s what it really is. The real race is the BQ-race. Boston is the icing on the cake once you’ve already won the day. 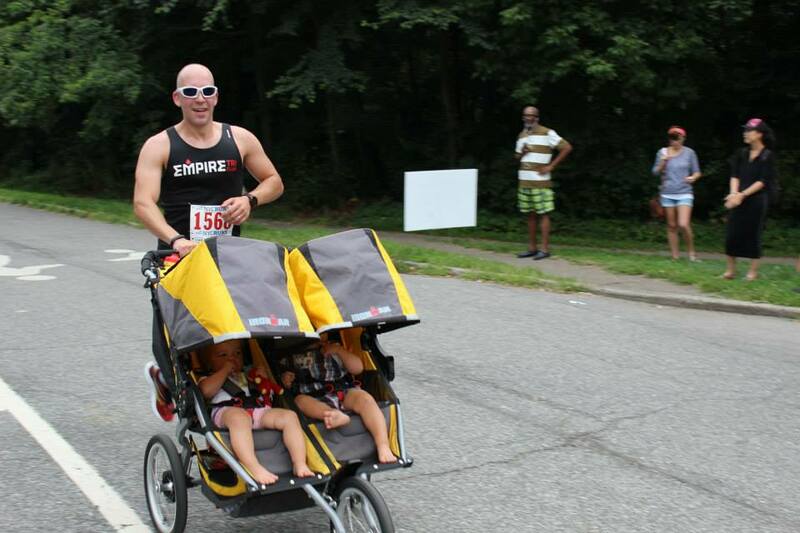 Dave, getting it done with the DOUBLE jogging stroller. Looks like this photo was taken in Prospect Park, my regular running grounds.